Ireland’s only truly internationally-known food brand. Since its creation, Kerrygold has been synonymous with quality, and today, Kerrygold’s product portfolio covers a multitude of product ranges in over 60 markets around the world. Generations of dairy farmers have supplied top quality milk for the Kerrygold brand, and the success of Kerrygold around the world is attributed to the world-class milk they produce every day. Our dairy farmers are committed to the co-operative ideal; working together to produce only the very best grass-fed dairy products. Our cows graze freely on the fields of our 14,000 small family farms; each one using unique dairy farming traditions passed down through generations of family. It is this grass-fed milk that delivers the rich tasting, higher quality dairy products that Kerrygold is famous for. Today, consumers all over the world can enjoy the unique taste of Irish grass-fed dairy. 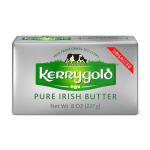 Kerrygold is currently the number one butter brand in Ireland, the number one butter and cheddar brand in Germany and the number two butter brand in the USA. Kerrygold Butter is a premium butter, produced to the highest standards. It is a completely natural product, free from artificial colourings and flavourings. The uniquely golden colour of Kerrygold butter occurs naturally as a result of beta carotene in fresh grass and gives a distinct flavour to the butter. Kerrygold Spreadable products combine our delicious Kerrygold Butter with olive oil, rapeseed oil or canola oil, to deliver the great taste of Kerrygold that you can spread straight from the fridge. Kerrygold cheese comes in a variety of ranges to include cheddar, Emmental, Regato, Dubliner and Cashel Blue. 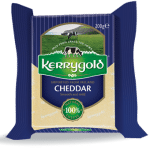 Kerrygold Cheddar is available in a variety of formats; red and white and cheddar, mature, extra mature, vintage and light cheddar. It has a smooth firm body and distinctively creamy taste. Kerrygold Emmental has a mild sweet nutty taste and fragrant aroma. It is produced from part-skimmed Irish milk, ageing gives it a distinct delicacy and rich texture. Kerrygold Regato is a hard Italian-style cheese characterised by its tangy, piquant flavour and versatility. Kerrygold Dubliner has a distinctive rounded flavour, a natural hint of sweetness, and is aged for 12 months. It has elements of mature cheddar, sweet nutty tones of a Swiss and the piquant bite of aged Parmesan. Kerrygold Cashel Blue is a semi-soft, creamy Irish farmhouse cheese, distinguished by its round, full flavour and signature tang. 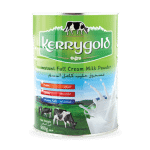 Kerrygold Milk Powder is a premium milk powder produced from fresh, high quality full-fat milk. It mixes easily to provide a delicious creamy milk taste and is fortified with vitamins to provide essential nutrients. Kerrygold Avantage is our premium fat filled milk powder, suitable for the whole family. Produced from natural, fresh skimmed cow’s milk and vegetable fat. Kerrygold Milk Powder is available across a range of markets in Africa. 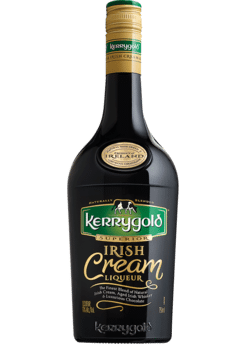 With rich cream, from the milk of grass-fed cows, velvety real chocolate and just a hint of oak-aged Irish whiskey married in to create a perfectly balanced taste, Kerrygold Irish Cream Liqueur is the richest and smoothest Irish Cream Liqueur you can indulge in. Kerrygold Yogurts are rich creamy yogurts that get their distinct and creamy flavour from the milk of grass-fed cows and the exclusive use of natural ingredients. With a high fruit content, our rich and creamy fruit yogurts are available year-round in the following varieties: strawberry, raspberry, blackberry, cherry, peach passion fruit, lemon, rhubarb, orange, blueberry, apple pear and mango. 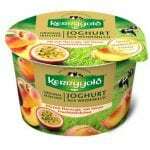 Kerrygold Yogurts are currently available in the German market.